Born in 1961, kolkata. Studied at Rabindra Bharati University, Santiniketan. He paints spiritual landscapes and seascapes in watercolour executed with a classical technique. He exhibited his work at Art Age Gallery,Kolkata, 1994; "Young Creative Faces Of Calcutta", Pune, Maharashtra, 1993; Indian Society Of Oriental Art Annual Exhibitions, Kolkata,1990; Academy of Fine Arts Annual Exhibitions, Kolkata, 1985-1991. He received awards like Annual Exhibition, Rabindra Bharati University "Unifest" at I.S.M., Dhoulad. 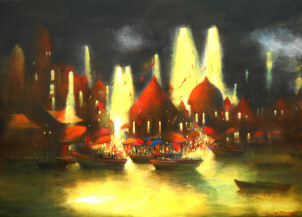 Banaras evening aarti | 34.5" x 45.5"